The film opens like a 3D IMAX documentary. Astronauts floating in the largest void possible, space. The 3D draws us into an incredibly immersive 13 minute opening scene that culminates in the most intense destruction imaginable. Alfonso Cuaron explained, “… The other thing was to create that reality those documentaries – those are one single shot. You don’t have intercuts or stuff. Want to represent a space mission almost with all of its finality before disaster strikes, and then the camera, from being objective becomes the point of view of the camera, and from that point on, the camera is a third character that is the audience POV. So the audience is experiencing this journey together with the characters”. It took Alfonzo Cuaron five years of planning to bring the vision of Gravity to the big screen. 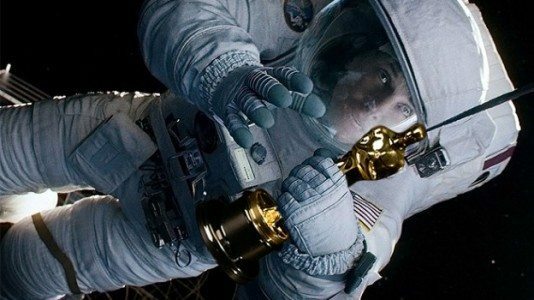 Written by Cuaron and his brother Jonas with cinematography by Chivo Lubezki and Stereography by Chris Parks, Gravity blasted off from the box office and has been in high orbit ever since. Global Box Office receipts have hit over $360 million and still gaining attitude. Back on the ground the movie has garnered near universal praise including none other than 3D Admiral of the Fleet, James Cameron calling Gravity, “the best space film ever done”. In a move that caused many 3D industry experts concern, Gravity was shot entirely in 2D and converted to 3D. In the past there’ve been some spectacular failures of 2D to 3D converted movies. But this wasn’t one of them. 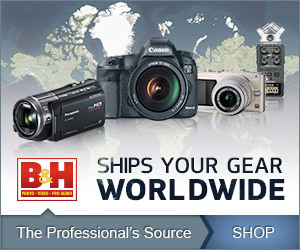 In fact many now say that this has truly legitimized the 2D to 3D conversion business. I spoke with Richard Baker, Senior Stereo Supervisor and Matthew Bristowe, Senior VP Production, VFX and View-D, Prime Focus World, London, the exclusive 3D conversion partner. Al: From the world premiere at Venice Film Festival and Telluride, you have been getting heaps and heaps and heaps of praise for this movie. First of all congratulations. It is a fantastic job. It is absolutely marvelous. I went to see it in IMAX 3D. I think that’s the best way to see it. As a Filmmaker I find it difficult looking at my own production. I’m just so critical of how I see the things and I often wish that I could change this or that. How did you feel sitting down watching Gravity for the first time? Richard: Well it is one of those rare films that can actually make you forget about working on it, I was actually detached from it and just enjoying the movie. It was so intense. The story was great. Sandra (Bullock) was just encapsulating, her acting and just the way she came across. I was keenly looking how our stuff was integrated with theirs (Framestore) that was probably the areas I was looking on the most. And also you know I haven’t seen the file passed on convergence that Chris Parks that has done as well so I was kind of interested in that. So there were the areas I was aware of but all said and done I was able to quite detach myself and enjoy getting into the movie which was fantastic and also that is quite rare. Al: This is a very unique experience in that unlike a lot of films lately where they shoot it in 2D and then after thought is to convert it to 3D. You guys chose to shoot 2D for very specific reasons. This whole workflow was totally unique. Between Prime Focus, Framestore and the production company, what was that like? It had to be crazy. How did you get into this and how did that all evolve? Richard: Well I got in 3 years ago Nikki Penny, the VFX Producer, approached us. She is London-based for many years and Matthew (Bristowe) and I had worked with her in previous shows. So she came to us because basically they had done some stereo test shoots. It proved quite challenging. One, because of the stereo rigs. Two, they wanted to attach the stereo rigs to these robotic arms which had pre programmed the moves in Previz at Framestore. When you think about the film it’s like an animation film really, very much, heavy Previz. After the test shoot, they came to us, Nikki knew us. We just finished “The Dawn Treader”, the Narnia film. And basically she came to us and said,” Can you call back the guys and we’ll do some sort of test to see how it holds up and what it looks like compared to the native stuff “. So we did that test. They really liked it. Alfonso came in and David Heyman (Producer) and pretty much from that point they decided not to shoot stereo. So it became a full model production. Framestore had a huge amount of work to in doing visual effects and not having to complicate certain amount of shots by reducing those to 2D files, basically simplified 30 minutes of the film. Matthew: I think it is, also, even though we are always working on a schedule unlike other shows where you can often be very back-ended because of huge turnover for visual effects towards the end of the stereo schedule. We did actually have time to do the necessary R&D and craft the stereo as well. So often in converting shows, you often really push up against the delivery and not that we will compromise, but you know after the show, how it’s gonna be felt, you know if you have a little more time, you can put a little more craft in there. Luckily on this one, we were afforded that. The way that we built our pipeline into Framestore’s pipeline. So in terms of the sharing of assets, partially converted shots to Framestore to take it to their pipeline and get back to us. Actually the deadline is quite tight because there is such dependence on our work. It is the whole thing if we have failed to deliver at a key time, then the impact to Framestore, it could have been massive as well. But you know, we were allowed to work with Chris Parks and with Alfonso to get it right. There was never a time where it was, “well that’ll do”. We had to get it right and we got it right. Richard: The thing is how we were working in tandem and that was very much the case on this. So after the production ,we’re out to Framestore and went through all of the shots that they were choosing and yet it was pretty tight in those days. Matthew and I saw an edit of that about two years ago, Previz, rough combs and animation and it blew us away at that moment. And that was like two years ago. The film didn’t change that much from that point. It was very well structured and planned out. So we have to look at the shots and kind of work out the approach for each one with me coming from a VFX background and it seemed pretty obvious to use assets that are available and now that we have the time as well. So the geometry, the shots of capsule from the light arc. Framestore was tracking, every shot so it shows the plate come in, they will track it, turn over the plate to us with the 2D match move. We then do it like a master scene for the inside the capsules that Sandra was in, so we then actually use that track and from the geometry, render out depth maps. We didn’t use the geometry for projection. It was a real geometry-Roto-hybrid, if you like. Particularly with the length of the shot. Having a rendered shot of the capsule just gave us consistency. We had cyber scans and sometimes a helmet from models and we would combine that with Roto for a body that we animated. It was a real hybrid approach. Using the assets and being in tandem with Framestore was a key thing…there were a couple of types of shots. There was predominantly drama in the capsule but there were straps or pens (floating). Then there were shots were we would convert into stereo, and then Framestore would want that stereo, left and right eye, so they could render stereo visual effects like the teardrops and the few helmet shots and things like that. Conversion isn’t linear like in Maya. So our cameras had to work specifically for certain areas in the shot so that when Framestore use our cameras they could then render a helmet floating and be in the right place in depth. So that was quite tricky really and we had the R&D team do some math wizards and get these things to work exactly right. And of course, with assets going backwards and forwards, there were new versions and things like this so between our productions, we had to pretty much come into sync with each other. 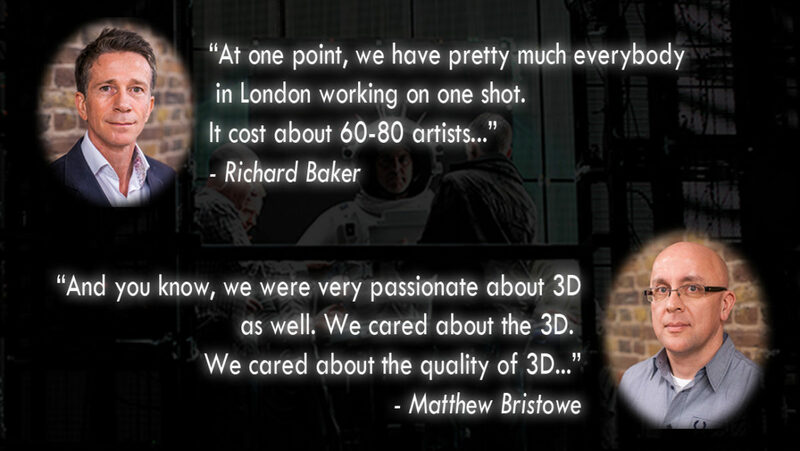 As Matthew was saying, Framestore would be working on a shot, waiting for a Prime Focus asset before they could finish. So we were very much schedule in to the shot scheduling internally at Framestore. It was challenging in every way. Al : Matthew you were kind of coordinating the international part of this because some of the work, I understand, was being done in London and some elsewhere. In India? Matthew: India is very much the driving force of all the things that we work on. We’ve got a big team of artists in London but that was supported by the teams in India, which are three times that size, which enables to do big shows and multiple projects at the same time. Actually on this one, we kept all the stereo work in London. All of the Roto was done in India. Some of the paint work was done in India as well. There was two reasons to keep it local in London. One is because of this movie was really woven into Framestore’s pipeline. And Framestore is literally two minutes up the road and it worked on that level because you know, that kind of closeness and proximity helped as well. But also in terms of guiding the show through the facility to the company was quite tricky as well. Because we are a big company. We are working on big shows. Sometimes money is an issue, strategy is an issue as well and plus we realized two years ago what an important film this is going to be. Actually on paper , it doesn’t sound that big. So even though it’s Alfonso Cuaron, it’s David Heyman, we got 30 minutes of converting, you know, shots of Sandra in capsule. It doesn’t sound like it is going to be a big thing. It needed looking after and nurturing as well. So that was an important key thing. And also even though the skills of our India artist are really advanced and they work on 70-80% of our big shows, the London team is a very seasoned team. We’ve been in this 3 years and in lots of shows as well, so for the new R&D stuff that we were developing on this, I think it is important to keep it, out right. It just suited the nature of the project. Matthew: “Hold on a minute, Matthew, you’re using 3000 paint days on this tiny little show which is making no money…”. So you know what you mean we had to look after it to make sure we got it all right. Richard: It was great that we did have that support. But it was like that on the production as well I mean you could see for Alfonso, he kept pushing limits. Some people call it “changing things”, we call it “pushing the boundaries”. But I think it’s kept it going right up to the last minute and he had the support from the studio and from David Heyman as well. It was very much a project like that. Matthew: You know it’s true. The filmmakers needed our support as well. When the producers came to us with another big thing and it’s like, “Oh, can you help us out”, and of course, we were going to help out. It’s great that the film is getting recognition it rightfully deserves. And you know, we were very passionate about 3D as well. We cared about the 3D. We cared about the quality of 3D as well so when the film like this comes along which incorporates all the things that we care about, it’s great that the filmmaking community recognized that. This is truly a mesmerizing 3D film. Al: On that point, did you ever in your wildest dreams ever think that it was going to hit the heights that it is hitting? Matthew: I think when we were in LA last week that’s when it really hit home. We both worked on big films in our careers as well. It reminded me of Slumdog Millionaire, many years ago, when that started to gain momentum. And when that momentum grew you realize that actually this is bigger. It’s more than just our film. It belongs to lots of people there. And who people care about it. So I think I didn’t quite realized until now. Richard: Didn’t quite realized how much until now. It’s fair to say, in the visual effects community in London, over 2 years ago, people were talking about this as the “next Avatar”. And that was years ago. So it has always had that kind of buzz. And I am thinking “What is it? Why is it being classed as the next Avatar?”, you know, from that, with all the effects guys and stuff like that. Matthew: I think what’s interesting is, you know, we felt it was good. It was getting talked up as well. But that mean you’d meet its expectations. That’s the rare thing. No one could’ve imagine. Actually, yeah, it is as good, even better than we ever thought it could be. Richard: It’s good for us, I mean when another project comes along like this, if it does because It’s not that often. Not that common, that big success. There could be some good decisions made here internally about what projects to put our resources into, right? Al: Hopefully this is something that is broken ground, especially with the success that it has seen. Hopefully this will foster more of this type of 3D filmmaking where you guys get to stretch your boundaries as much as you have. And yes, I think it is very fair to say that this has raised the bar way above of Avatar. This is where everybody’s wanting to see 3D go. This is a movie where I’ve read reviews where people they can’t imagine not seeing it in 3D. And that 3D really played a role and we haven’t heard that kind of talking since Avatar. Even though there were some really good movies, some well-done 3D, this has established a whole new level where drama and special effects having joined into one. And the 3D really set the tone of the story. Richard: It’s all about the package isn’t it. The visual effects is great, the story is great, the acting is great. You get everything right, you’re also a winner in every aspect. Al: Let’s talk a little bit about the 15,000+ frame scene. Was that the hardest shot? Or what was the hardest scene that proved to be the most challenging for you?